The Highcon Euclid IIIS digital cutting and creasing machine has been specifically engineered to suit the needs of printers working in B2/29 in. format. In today’s competitive market, service is the keyword to business growth and long term success. By introducing digital capabilities to the finishing process, the Highcon Euclid IIIS opens up a whole new world of responsiveness for a wide range of applications. 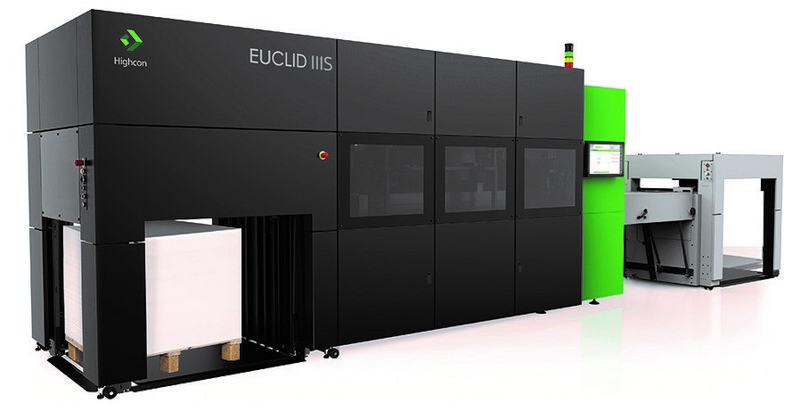 For converters and print service providers with digital print equipment, the Euclid IIIS enables an end-to-end digital workflow, removing the bottleneck at the post-print stage. For those with conventional printing equipment, digital finishing is the ultimate way to grow their business by extending the services they offer with a differentiated product offering. This easy to use, variable data cutting and etching software is a high value application for packaging, commercial printing and any printed communication, bringing the benefits of variable data to finishing. It turns a technical process into an opportunity for differentiation. Variable data cutting can transform simple products into premium ones by adding customization, personalization and security applications. The variable cutting can be performed per job as well as per sheet. Highcon Advanced Registration adds the capability to detect a printed mark on the sheet while inputting sheets into the machine paper handling process. This is on top of a mechanical registration that detects the edge of the sheets. This new module improves the registration of cutting and creasing, reducing errors resulting from printing. This is of particular importance for digitally printed sheets and can compensate for the inaccuracy of the printed image relative to the sheet leading edge. The waste stripping mechanism is a built-in unit inside the Highcon machines that automatically removes the waste from the smallest internal cutouts produced on the sheets by the lasers. The optimized cutting algorithms, together with a new substrate handling system ensure completely clean cuts that are essential for intricate cutouts. All the small particles drop into an easily removable chamber. This module removes the need to buy, setup or store a separate stripping tool and further advances the productivity of the machine. Cartonboard & labels 200-600 µ 8-24 pt. Microflute N+F+G up to 1.2mm up to 47 pt. Pile data Height of feeder pile, inc. pallet 1.1 m. 3.6 ft. Height of delivery pile, inc. pallet . 1 m. 3.3 ft.
Machine dimensions & weight L x W x H 8.6 x 2.1 x 2.3 m 28 x 7 x 7.5 ft.
Highcon delivers innovation and differentiation that converters, printers, and brand owners all need, transforming “finishing” into a value adding process to positively impact users’ profitability by increasing speed to market, eliminating costly production steps and reducing carbon footprint.